In need of a top provider for Cummins Onan generator repair in South Florida? Don’t entrust your generator to just anybody. Come to one of the most experienced and respected authorized Cummins Onan generator repair service centers in the region! Diesel Services of America is proud to be the go-to local choice for diesel engine and marine generator services. We specialize in a diverse variety of areas and are one of the oldest Cummins Onan service centers throughout the entire state of Florida. As countless people around the world have proven, investing in Cummins Onan generators is an easy choice. 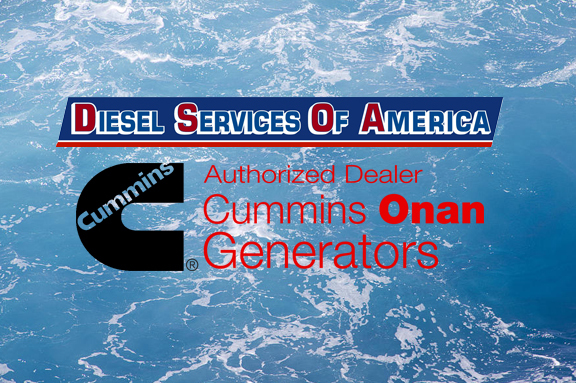 Cummins Onan has been widely regarded as a leading marine generator brand for decades due to their impressive capabilities, reliability, and affordability. The Cummins Onan generator repair service provider you entrust your marine generator to should be equally as reliable. Understanding the importance of following the manufacturer’s specifications along with having a deep working knowledge of the components and functions of each unit type is essential. Fortunately, these are exactly the characteristics that our technicians share. Each of our Onan generator repair specialists is highly trained and certified. Combine this with the wide range of tools and resources available in our state-of-the-art facility and it’s easy to rest assured that your genset is in good hands when left up to us. Visit Diesel Services of America in person to come to speak with a friendly member of our staff yourself. We are located at 2501 W State Road 84 in Fort Lauderdale, FL. You can also fill out our contact form on the side to email a technician any questions you might have. In addition to our marine generator services, we also carry a wide variety of marine generator maintenance parts for sale conveniently through our website. Having access to service parts on-hand allows us to keep costs down while increasing the overall time it takes to complete your appointment. To schedule a service appointment with us soon, call 954-781-1464 and we’ll be glad to work with your scheduling needs. We provide both on-site and convenient dockside services and service the entire South Florida and Caribbean regions.